Introducing the new Inspector II Tint Meter. A third the size of the TM200/TM400/Inspector and a fifth the weight, the Inspector II has the same features, auto-calibration, and proven accuracy of all Laser Labs, Inc. products. It works on all static glass up to half an inch thick. Perfect for inspection stations. The Inspector II works on all windows. Holding both sides together, turn them on. Then put the back meter onto the inside of the window, either holding it in place or using the suction cup. Put the front meter on the outside of the window over the back meter, and it displays the light transmittance value. Be sure to avoid placing the detector area over the defrost strips on back windshields. 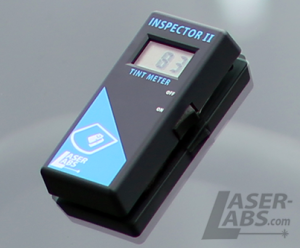 The Inspector II is far smaller in size than the original TM200/TM400/Inspector but works just as well, with built in protection from false readings and misuse. New design, better technology, same functions. 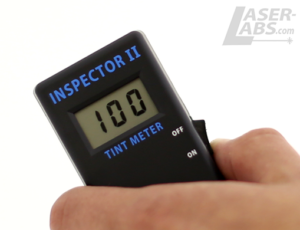 The Inspector II is a small, very useful tint meter. 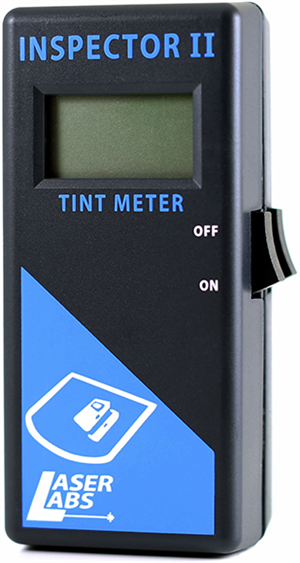 It can measure tint levels on any auto window at any time of day or night. Make sure to activate the meters BEFORE placing them around glass to avoid misreadings. Laser Labs, Inc tint meters use a light at 550nm to measure total light transmittance. 550nm (green) is the center of the human eye's light sensitivity. The bandwidth of 50nm spans the general range of color visible to humans. The measurement reads out a value between 0% (opaque material such as cardboard) and 100% (pure air). 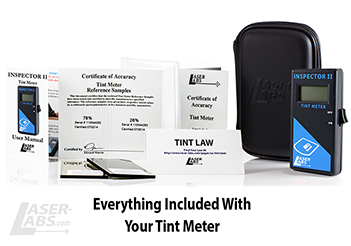 All Laser Labs, Inc Tint Meters are accurate within plus or minus 2% and are not affected by humidity. They are reliable from 0º to 100º F, day or night. Two N.I.S.T. traceable reference samples are included with each meter. 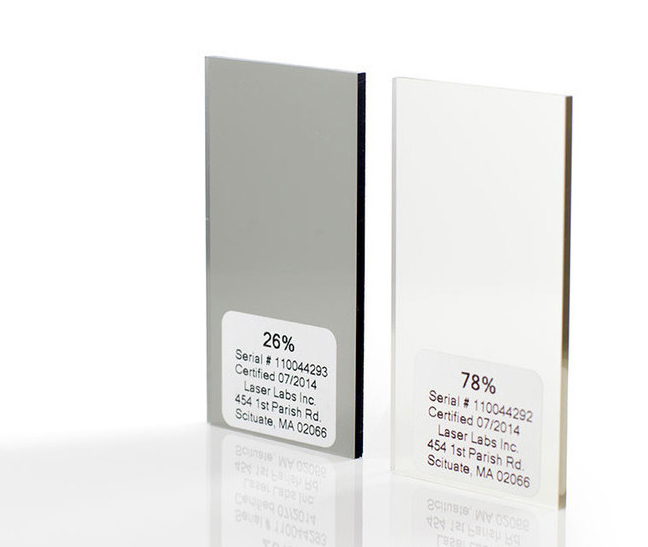 The lighter glass is high transmittance (65% to 80%), and the darker glass is low transmittance (20% to 35%). The Inspector II runs on two CR2032, 3V coin cell batteries which are included. They are good for 1000 uses and have a ten years' shelf life. Purchase replacement batteries at your local hardware, convenience store or online.